There can be points when running a CURE where there are tradeoffs between student learning and the best utilization of class time. In this case, we set-up and ran the PCR for the students ‘behind the scenes’ rather than using class time for them to do it themselves. These ‘black boxes’ can be detrimental to student learning, but are sometimes necessary to help with the overall flow and timeline for a CURE. Therefore, we started Week 8 with another re-cap of what happened to their samples, why, and how it connects to our next steps. 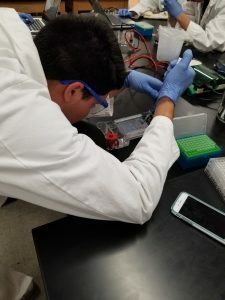 For class, we started by giving students the completed PCR reaction for their samples. We had a lengthy discussion about why we needed to make and run a gel of the PCR product, including the purpose of positive and negative controls. Students followed this protocol to set up and cast their gels. We had a small bottleneck at the microwave and at the loading stage, which made class go a bit longer than we expected. The class period ended before the gels had finished running, so we uploaded images of the gels onto the class drive to be discussed the following class period. Unfortunately not a lot of samples actually worked, which you can see here. While the gels were running, we filled the time with a discussion and demonstration about how to use social media for science. We had this discussion because part of the following homework assignment was to research and tweet about a scientific article they found interesting. We also asked them to do a teamwork reflection for their Term Project while considering the teamwork guidelines that were set for the project.